Windows Live Writer is god-tool to all Bloggers, no matter your file and rank. That is the first tool you install after installing any OS upgrade. Windows 8 is no difference to this rule, except there is a problem. If you decide to go the route of mobile computing and minimalistic blogging on the go, there’s no way to do that with Microsoft Surface or Surface 2. These are pure ARM devices that doesn’t allow you to install any other Desktop apps except for the ones that came with it from the factory. So you can’t install Windows Live Writer, bummer you said. No buying of Surface for you. Well I have good news for you. 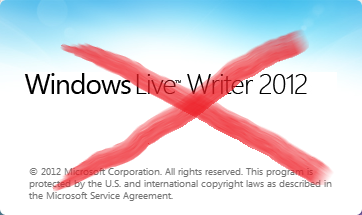 Whatever your reason will be, lack of Windows Live Writer will no more be your excuse. Those that follow me on Twitter know my whining to @Automattic every once in a while about the lack-luster WordPress app for Win8 they dropped in the Store about two years ago, and promptly forgotten about it. It hasn’t received a single update in two years. In this App, you’re practically limited to basic editing, and no local attachment of pictures. Yes, you can add internet pictures, but anything local is burst. I have begged them to fix this app to no avail. Then I started thinking critically, this is the 21st Century, live should be easier than this. For me, I have moved from Desktop Apps to fully mobile experience. I don’t install Desktop apps on any of my x86 Tablets, (Have about 3 of them), I can’t install on MS Surface that I love so much. I have gone the green route on my Desktops, so the less Desktop Apps the better. Then I remembered something from the young days of WordPress, they allow you to publish to your blogs by mail posts. Ok, lets check if it still exists in the 21st century, and there you are! It’s still a supported feature! Now don’t get me wrong, this is a glaring security risk, WordPress gives you a mail address to which you could mail anything and it will get published immediately. Therefore, if anyone should get hold of your address book, they can basically publish to your blog. But that is less frustration if you can manage the security of your devices. Now, let’s check if that mail feature supports full HTML markup. Picture and all. Voila! It does. So, there it is, WordPress problem on Windows Metro solved. We have a better tool in Windows 8 that is far better than Windows Live Writer, it is called OneNote. I don’t need to tell you about OneNote, it is an app that any Information junkie should be using. Period. 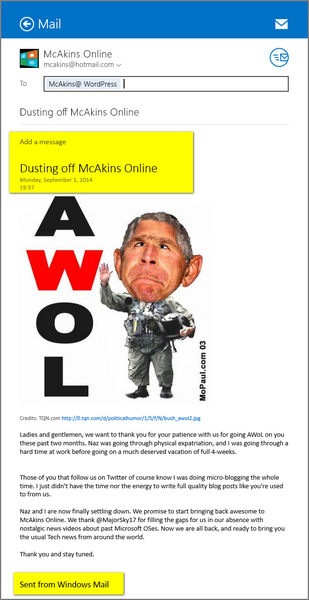 Now suppose I could compose my blog posts in OneNote, with its rich writing experience, spell-check, and formatting experience, I could just press the Share to button, select to Share to Windows 8 Mail App, select my Blog WordPress mail address and presto, a blog post. I am in paradise! 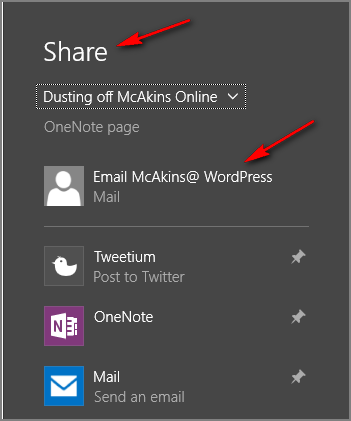 You get the full OneNote article in the Share Pane. Remove the OneNote Title metadata and Mail Signatures as shown in Yellow below. WordPress will use the Mail Subject line that has be entered for you by OneNote, you can of course change the title here. Press the Send Mail button and you’re done. Your post is live within half a minute. One disadvantage to this is that the posts are published under “UnCategorized” or default category. Also there are no tags, no excerpts etc. You have to login to WordPress to do these updates. But at least, you now have the chance from OneNote to Publish in no time. [UPDATE] What a joy, please neglect above strike-throughs. You can use shortcodes in your mail to specify all necessary tags and category information, and delay or set posting time! Just scroll a bit down on the page and read all about it. Of course this is a temporary solution till Automattic decides to update their WordPress client in the Windows Store. We just have to bear the little risk that if anyone hack your addressbook, they also have access to your site publications till you change the publish email address for your blog site. I so much no doubt will make sure to do not overlook this site and give it a look on a constant basis. Superb. As a OneNote user, this just reinforces how good it is.